Bargain Bytes | Bargain Bytes, Inc. The GXP-2140 phone is perfect for Enterprise and small to medium-sized business customers with the need for quality and versatility in their desktop communications. Check out our video with our Tech Guru Brendan talking about today’s eWaste problem. If you live in the Sioux Falls area, you can bring your eWaste to the Household Hazardous waste facility for free! It will actually end up at the Bargain Bytes facility to be recycled responsibly by our parent company SEAM– who is certified to the highest environmental and security standards in the industry including R2, e-Stewards, ISO 14001, OHSAS 18001 and is a member of NAID. If equipment comes in that is still in working order and holds some market value, you may even see it on our eBay store after it’s been securely wipes, thoroughly tested, and refurbished! SEAM stands for Secure Enterprise Asset Management, Inc. We are proud to have a name that truly reflects what we do. SEAM serves enterprise customers of all sizes to securely manage their IT assets at the end of their use, the end of their lease, or the end of their life. For a full description of what SEAM means, check out our new website at www.SeamServices.com. Hard Drive and Media Shredding – Available on-site at your location or offsite at SEAM’s secure Sioux Falls facility. Hard Drive Wiping – Great option for redeploying or reusing your drives. Serial # and Detailed Asset Reporting – Our new proprietary tracking and reporting system follows your assets from the point of pickup through the rest of the process, letting us report the details back to you. Online Customer Portal – Along with a new website, we have also invested in a new Customer Portal to let you have easy, 24×7 access to your reports when you need them. Pickup and Recovery Services – Our professional team will come to your location, collect, pack and load all of your equipment for secure transport to our facility. Collection Containers – We offer a variety of containers for you to conveniently collect your devices until they are ready to be picked up, from hard drive security carts to safe CFL bulb drums. Refurbished Equipment – All of our refurbished inventory is now available online. We have kept the Bargain Bytes name for our online store, but our services and facility have taken on the new SEAM name to focus more on security and compliance. Clients may be NOW eligible for revenue sharing if their equipment is able to be resold. Certified IT Recycling – We will continue to offer our certified electronics recycling services, along with a Certificate of Destruction and Recycling to keep for your records. You will see the new name and logo in our communications and on our building, but other than that, it’s business as usual. 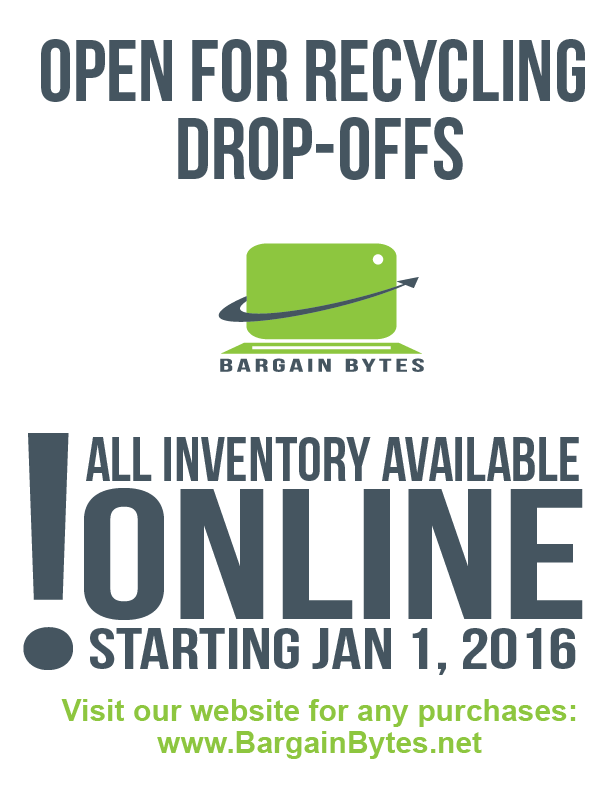 If you’re shopping for Bargain Bytes equipment, you can find all inventory online. If you have any questions on a new service or have a comment on the new name, contact SEAM or visit www.SeamServices.com. Used by the military and police departments, this Panasonic Toughbook can survive it all. The Bargain Bytes Tech Guru takes us behind the scenes of Bargain Bytes’ refurbishing and remarketing process. Check out this powerful, expandable desktop, the Dell Optiplex 7010. What is R2 Certification and Why should You care? The #BargainBytes Tech Guru talks about the importance of using a certified IT Asset Disposition vendor for your off-network IT equipment. The tech Guru reviews this “pint-sized powerhouse”, billed as the perfect travel companion.